Did you know that the Supreme Court just issued a landmark ruling? I’m not talking about health care. I’m talking about land. That’s right, the high court came down 9-0 for landowners in a suit that was brought against the EPA by Idaho’s Sackett family. We’ve been following Sackett v. EPA for over a year. 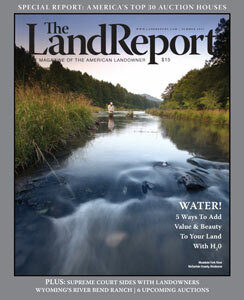 It’s one of the many eye-opening stories you’ll enjoy in the Summer 2012 issue of The Land Report, now on newsstands from coast to coast. You can access the digital edition free of charge HERE. Our summer issue also features the story of an innovative gift to the University of Wyoming, one that kicks in when Wyoming’s River Bend Ranch sells. It’s a great example of stewardship, one that Greg Fay brought to us and that we are proud to share. Learn five great ways to add value and beauty to your land by improving your waters. And be sure to have a look at our third annual roundup of the nation’s leading auction houses. No surprise here … farmland prices continue to best record highs. So be our guest and enjoy our latest issue HERE. For more up to the minute reports on listings, auctions, sales, and breaking news pertaining to land and landowners, be sure to follow The Magazine of the American Landowner on Facebook, Twitter, and Pinterest. 1 Pings/Trackbacks for "The Land Report Summer 2012"